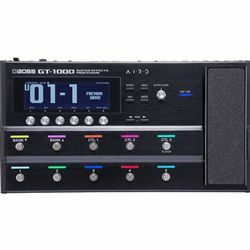 The Boss GT-1000 represents a multi-effects processor like no other. The heart and soul of which is the groundbreaking new AIRD (Augmented Impulse Response Dynamics) technology, realized with decades of advanced BOSS research and supported by an ultra-fast DSP engine, 32-bit AD/DA, 32-bit floating-point processing, and 96 kHz sampling rate throughout. With Boss’s acclaimed Tube Logic approach at its core, the comprehensive AIRD system in the GT-1000 brings unparalleled musical response and flexibility to a digital guitar processor. AIRD amplifiers live and breathe like real tube amps, and with sophisticated Output Select functionality, you’re able to consistently achieve this amazing sound with any setup, from standard guitar amps to full-range playback systems. With the convenience of built-in Bluetooth®, you can adjust sounds, configure control assignments, and organize patches wirelessly from your mobile device using the BOSS Tone Studio app. AIRD (Augmented Impulse Response Dynamics) technology realizes BOSS’s acclaimed Tube Logic concept in a digital guitar processor.